With all the heavy carbs I have been making lately, I felt like something simple green and leafy for dinner tonight. 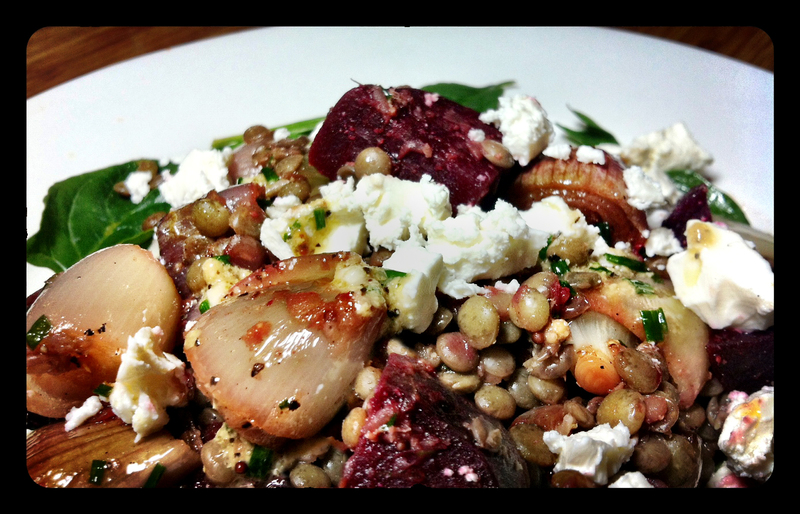 Winter is always a good time for roasted vegetables, and combined with the fresh baby spinach and a tangy mustard based dressing this recipe for Roasted Shallot, Beetroot, and Lentil Salad, from the Hub-UK website, was exactly the kind of meal I was craving. I have found many people do not know what a shallot is. This vegetable belongs to the same family as onions and garlic, and is thought to have originated in Central or Southeast Asia. Like garlic, shallots form in clusters with a head composed of multiple cloves. Shallots are used in many different cuisines from around the world. They taste somewhat similar to an onion, but have a milder flavour. You can easily make this recipe Dairy Free and Vegan by leaving off the cheese. Put puy lentils into a medium pot of boiling water and cook until done. Drain the lentils and rinse under water and place in a bowl. If using fresh beetroot, chop into large pieces and put into a pot of boiling water. Cook for about 10 minutes or until the beetroot is mostly cooked. Put the shallots into a roasting tin, drizzle with the 2 tablespoons of oil, toss well and season with sea salt and black pepper. Place roasting tin in the oven for 15 minutes, then add the beetroot and drizzle with honey and toss well with the shallots. If using solid honey, put it in the microwave first for about 20 seconds to make the honey runny and easier to coat the vegetables. Roast for a further 10 minutes, or until the shallots are soft. To make the dressing, mix all of the dressing ingredients together and season with sea salt and black pepper. When they are ready remove the shallots and beetroot from the oven and mix with the lentils and half the dressing while still warm and leave to cool. To serve: Place a large handful of spinach leaves onto a plate, top with the shallots, beetroot and lentils. Crumble the goat’s cheese on top, and drizzle with some of the remaining dressing. You can serve this on its own, or with a hunk of crusty bread and a glass of medium bodied red wine. Heheh . . . I did not know that they call spring onions shallots in OZ. Somehow I must have missed that when I lived there 10 years ago. I know it is confusing here in NZ when I call spring onions “green onions”, as we do in The States.